The New Year approaches and soon the Virginia General Assembly will convene its 2015 session. With that in mind, attached are two documents. The first attachment is titled A Tale of Two Resolutions and it briefly explains important differences between the two Article V resolutions that will be voted on after the General Assembly convenes on 14 January. One resolution is exactly what we want our State representatives to pass. The other resolution will not effectively rein in the Federal government and may make things worse. Whether by phone, email or letter mail it's important that your House Delegate hear from you before and after the General Assembly session begins. You can use this document's Talking Points to help craft a message conveying exactly which resolution for which you want your Delegate to vote "Yea." The second attachment is a flyer for an Article V presentation that will be held on 10 January, Saturday, 1-3 pm, in Prince William, VA. The two presenters are our Virginia Legislative Liaison (and Citizens for Self Governance Staff Counsel) Rita Dunaway, and Founding Member of Middle Resolution, Bob Bailie. Middle Resolution is a high profile Virginia grassroots coalition with members from across the political spectrum; it's "proud to support the Convention of States Project to rein in federal overreach." The event featuring this presentation is a 51st House District Town Hall, sponsored by Del. Rich Anderson. Please promote the event with others, attend yourself if possible, and ask your own Delegate to have an Article V presentation at his or her next Town Hall. You can also keep up with Virginia Coalitions Director on Twitter. At this particular time this is not a duty the President should delegate. Your thoughts? 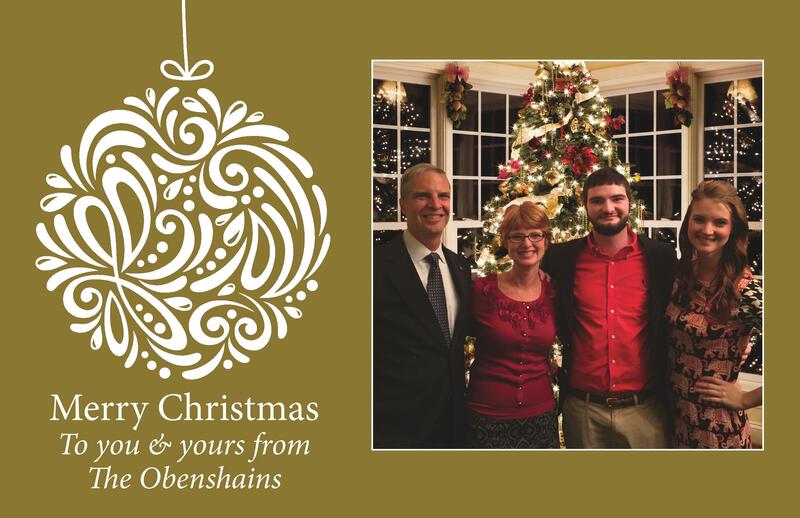 From my family to yours, Merry Christmas and Happy New Year! Here in the Commonwealth and across America, we have a lot to be thankful for as we join our friends and families to celebrate this holiday season. As I pause and take stock at the end of another year, I just want to let you know how grateful Suzanne and I are for our many friends across Virginia. I am honored to have the opportunity to continue to serve in the General Assembly, and I am especially grateful for your friendship and support over the years. This holiday season let us not forget that there are men and women at home and abroad putting their lives on the line to protect each of us. As we sit with our families and celebrate this time of year, we must not forget that we are able to do so because of the profound sacrifices they make on our behalf. I look forward to 2015 and working alongside you on the issues that are important to Virginia families. Suzanne and I wish you a safe, blessed Christmas and a prosperous New Year! Copyright © 2014 Cuccinelli for Governor, All rights reserved. You are receiving this email because you opted in to receive the Cuccinelli Compass. If you are receiving this message, then you have indicated some support for the Convention of States Project's mission--to end federal tyranny by emboldening our state legislators to use their constitutional power to restrain our runaway federal government. If you are receiving this message, it also means that you have not yet signed our online petition, which gets instantly sent to your Virginia Delegate and Senator and asks them to support our application. The General Assembly will convene in Richmond in just a few short weeks, so now is a critical time for us to amass these petitions. You are the most powerful voice your legislators can hear, and they are the only ones with the power to stop the federal leviathan. We must urge them to use their power to protect our rights and restore our republic. Will you please take 2 minutes to sign our petition--for liberty? Will you commit for the 2015 General Assembly session? Make sure your legislators are hearing from you. January 14th is the first day of the 2015 General Assembly session so prepare now to make your voice heard in Richmond. Consider signing up as an Action Ambassador, The Family Foundation’s grassroots network of pro-family citizens who are empowered to influence Virginia public policy. As an Action Ambassador, you have the tools necessary to influence and support your elected officials in the Virginia General Assembly. Appeal - Pray for your legislators on a regular basis and ask God to provide these officials with godly wisdom and conviction. Connect - If possible, meet with your Senator and Delegate during the year when they are in their home district to build a lasting, influential relationship. Some of our Action Ambassadors have not been able to meet with their legislators for various reasons. We highly recommend that you meet with your legislators out of session if you are able. Transmit - Communicate with your legislators through emails and phone calls when important legislation is being considered in their committees or on the floor. Our email alert system makes it easy for you to contact your Senator or Delegate when they need to hear from you. Just remember the acronym A.C.T. Please consider getting involved so you can expand your influence in Richmond and across the Commonwealth. Click here to let me know that you will partner with The Family Foundation by becoming an Action Ambassador. Chip Tarbutton MA, PMP has an updated profile (Volunteer Experience). Matt Quintero has an updated profile (Education). chris adams has an updated profile (Volunteer Experience). The General Services Administration, which oversees and manages the federal government's open data hub, has released a document to help more agencies publish their datasets to the platform for public use. You are receiving Network Updates Digest emails. Unsubscribe. This email was intended for Robert Bruce Alexander (Professional Allwright). Learn why we included this.